You don't mind two circle skirts in a row, do you? But, it was fun to wear with a biiiiig looped-up scarf and my new-fave faux leather jacket--and any excuse I get to wear these Target wedges makes me happy. Wanna see without the jacket? The full skirt is so fun!! The scarf is a regular one I just looped around to make it seem like an infinity scarf. They are much easier to wear, as well as a little more stylish, than a hanging scarf! Love the darts on this Simplicity pattern. The angle is flattering, I think! Scarf: Banana Republic via a resale shop. Watch: Forever 21. Belt: ? it's great with the leather jacket on.. love the whole look! Love the whole look- gorgeous! Lovely outfit! 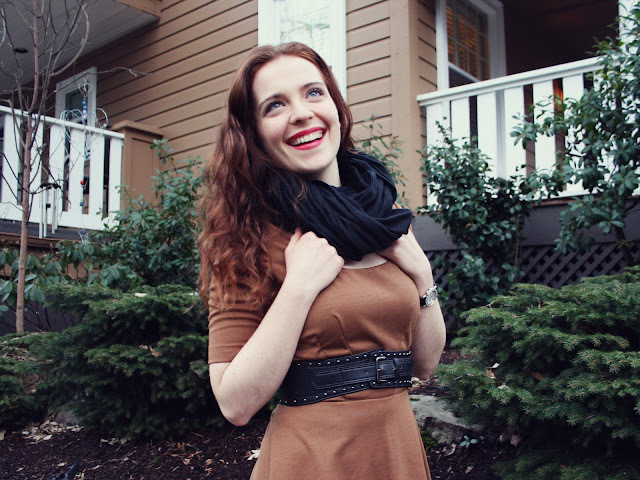 The belt goes so well with the dress and the leather jacket. Super cute! 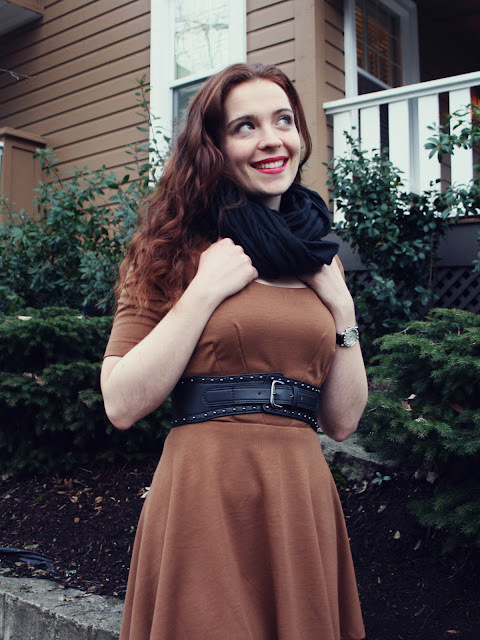 I love the neutral tone of the dress; you could so easily switch out the belt for a colorful one (I have a rainbow of skinny ones from Naked City, about $4 each)for a completely different look. Or you could keep the jacket, scarf, and belt but change into colorful tights and simple flats for a more casual Hawthorne/Mississipi look. So versatile, I'm jealous! Definitely going to use one of my Jo-ann coupons for some stretch knit this week! Great idea! A colorful belt would be fun!! Eeee, thank you! I was actually really happy with these pics, and these are definitely better than some previous ones! It's still a little unpredictable, though--some pics for next week? Not as good! Thanks, though! I like the color and the darts. I agree, it is definitely tights length. I don't think many people could get away with wearing something that short with bare legs! I'm interested in the darts on your bodice. They are longer/higher than I would have expected, and they look great without any bubbling or 1950s bosom point (which is what I'm currently struggling with!). Do you think that's because there are two slimmer darts rather than one on each side of the bodice? I'm so open to any tricks you might have for smoother darts. Absolutely! I am really careful when putting the darts in, but it also really helps to have two darts instead of one. You can always alter where the darts end depending on how high the fullest part of your bust is, and you can choose to take the amount that would have been taken up by one dart and spread it out over two, however. Or, just find a pattern with more darts! I love it but I would have made the skirt a bit longer. A wide skirt that short looks like a figure skater's. The rest of it is beautiful. looking so pretty in this outfits.